Under Russia’s leadership, the G20 achieved major agenda changes. The presidency passed to Australia on Dec. 1. Changing the G20 agenda from an anti-crisis to a strategic development one was a major achievement during the club’s Russian presidency, according to several Russians involved in the talks with the club of the world's 20 largest economies. Russia officially passed the torch of the G20 presidency to Australia on Dec. 1. 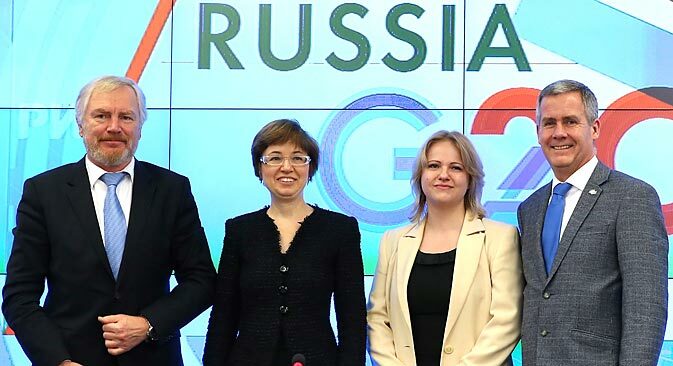 After the handover, G20 sherpa Svetlana Lukash joined her predecessor, Ksenia Yudaeva, who had recently moved to the Russian Central Bank, and Russian Deputy Finance Minister Sergei Storchak, to reflect on what they saw as the main successes of Russia's presidency of the G20. "The main thing that the G20 has been busy with [over the past five years] has been anti-crisis measures, in one form or another. I think that starting from our presidency, the G20 will focus increasingly more on a new agenda for development and on ways of leaving anti-crisis measures behind," Yudaeva said. Russia "made the first step towards structural reforms, while the Australian chair will turn this step into a proper movement," Storchak said. Attempts to do that, all the speakers admitted, had been made before -- for instance at the summit in Toronto -- but have failed. Over the past year, in Storchak's opinion, "the G20 demonstrated its ability to cooperate not only in a time of crisis." "We have proven that when national interests become a priority…G20 countries are capable of agreeing," he said. A year ago Russia set out three main priorities for its presidency and, according to Lukash, it managed to achieve them. They were: growth through quality jobs and investment; growth through trust and transparency; and growth through effective regulation, which includes the fight against corruption and tax evasion. "For the first time ever, developed countries have taken on obligations to reduce their budget deficits and conduct structural reforms,” Lukash said. Storchak explained that the target was to achieve deficit-free budgets by 2016. The issue of jobs, also "for the first time ever," began to be viewed "not as a consequence of economic growth, but as its cause". Lukash said: "We have devised an employment growth and unemployment reduction map of the world, from which each country can select and put together its set of measures, meeting its individual requirements." Another thing, which too had previously not been part of the G20 agenda, was an integrated approach to developing labor market policies. "We have agreed that we shall take into account macroeconomic, financial and social conditions," Lukash said. During the past 12 months, the G20 has agreed to develop and adopt a new multilateral information-exchange standards on taxes. Lukash described this process as "the biggest step in the past 100 years toward improved coordination in the global tax policies." Another breakthrough was the decision to extend the G20 moratorium on additional protectionist measures until the end of 2016. "Clearly, it is a factor for ensuring predictable conditions for doing business all over the world," Lukash said. This decision will make it possible to boost investment activity globally in those sectors that involve active export and import of goods and services, she continued. In addition, G20 members agreed that since now nearly half of the world's trade takes place within regional trade agreements, the task of the G20 was "to ensure transparency of these agreements and universal rules of the game, so as not to put up barriers to business and to ensure maximum transparency of decision-making." The key outcome of Russia's presidency of the G20, according to Yudaeva, was the St. Petersburg Action Plan, which sets the G20's strategy for achieving strong, sustainable and balanced growth. "The summit in St. Petersburg confirmed the G20's role as that of a leading economic forum and has allowed us to consolidate our efforts. Now all the countries have clear plans for managing the economic situation, for creating jobs and attracting investment," Lukash said. For his part, Ambassador Paul Myler said Australia would build on things achieved during Russia's presidency. However, Australia would not stray into politics, as the St. Petersburg summit did, he said. During the St. Petersburg meeting, Syria became the main issue on the agenda. Since then, the Syrian crisis has become somewhat less acute. According to Lukash, the discussion and resolution of the Syrian issue was also one of the achievements of the summit. Myler stressed that political matters may feature on the agenda of the Brisbane summit only in an emergency.